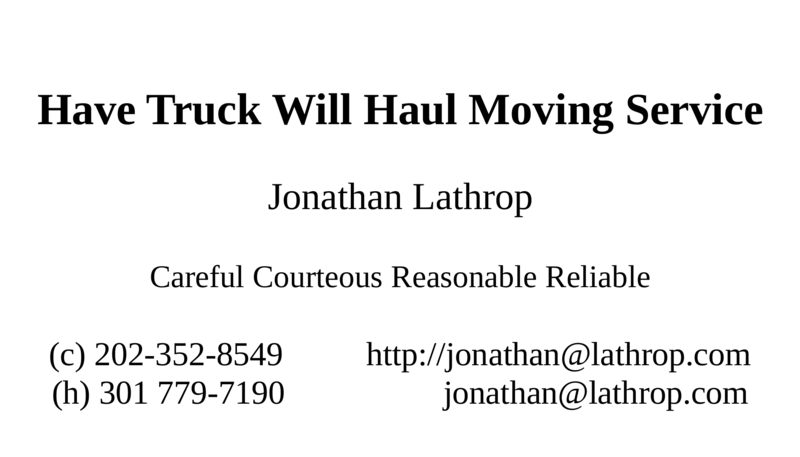 Get a free* "Have Truck Will Haul Moving Service" refrigerator magnet. Just fill out the form below and I'll pop one in the mail to you. The send email function on this page had not worked for a long time due to changes by my ISP... With some work it is now working again. * Fine print: these are intended for my customers or potential customers in the Washington DC Metropolitan Area. So, if you don't live in the Maryland, Washington DC, Northern Virginia area , please do not ask for a magnet. Return to the Index of all my pages. Return to Have Truck Will Haul Moving Service.